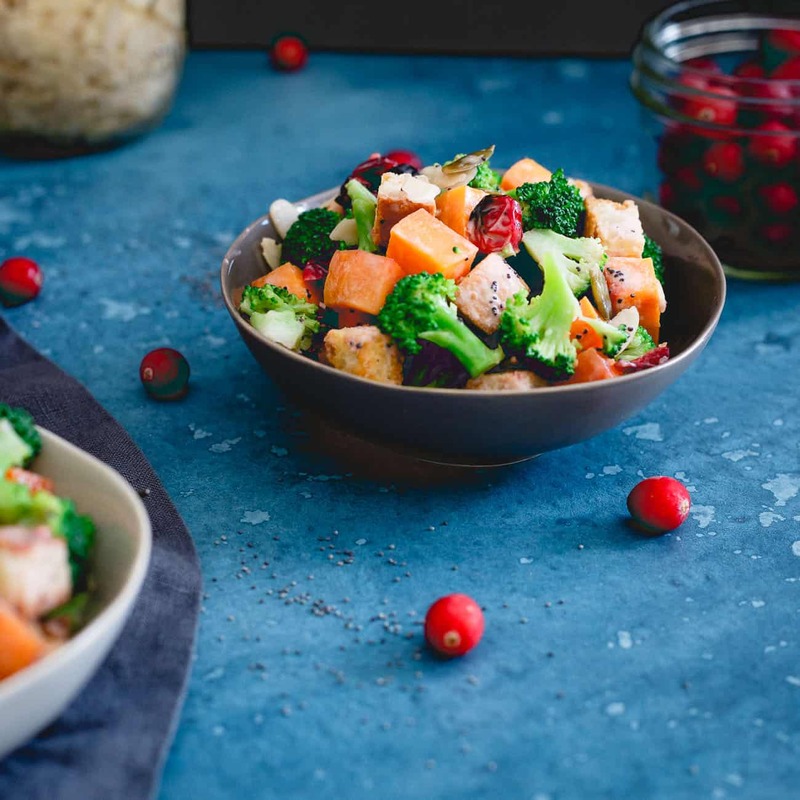 Maple syrup roasted cranberries and butternut squash are added to this fall inspired broccoli salad with toasted croutons, almonds and pepitas. This roasted cranberry broccoli salad has a long history. Knowing I wanted to create something with cranberries for this month’s health and wellness partnership with Udi’s (since they’re quite the fall/winter superfood) the ideas were ALL over the place. I went from crostini (kind of a cop out, right? ), to French toast (but didn’t want to compete with this raspberry granola French toast) to some sort of gratin (before remembering this butternut squash and cranberry gratin from a few years back) to bread pudding (but I did that before too with this chocolate strawberry bread pudding!) to everything in between you can think of. 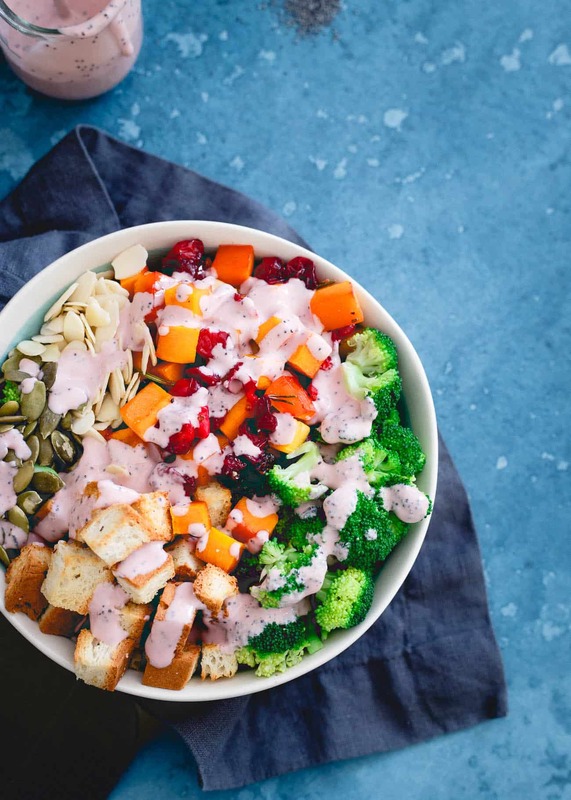 At the end of the day, I threw some of my favorite healthy seasonal superfoods on the counter and piece-mealed this roasted cranberry broccoli salad together. True life, that’s how half of things on this site come together. It’s hard to go wrong when maple syrup, almonds, pepitas and crunchy toasted Udi’s sandwich bread are added to fall staples like broccoli, butternut squash and cranberries. 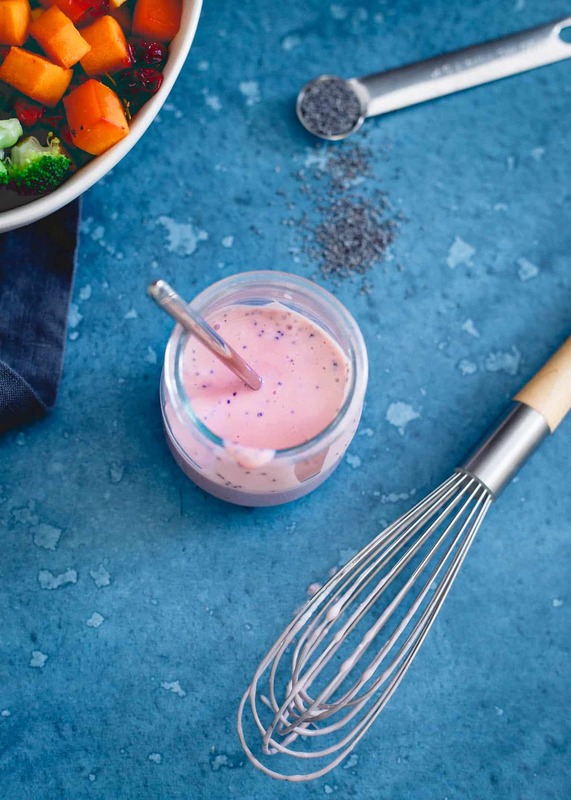 The simple cranberry yogurt poppyseed dressing is just icing on the cake. Broccoli – loaded with fiber, cancer fighting antioxidants, vitamin C which helps in iron absorption, vitamin A and calcium. Cranberries – promote stomach and bladder health, anti-inflammatory, good source of fiber and polyphenols, compounds that contribute to whole body health, including heart health. 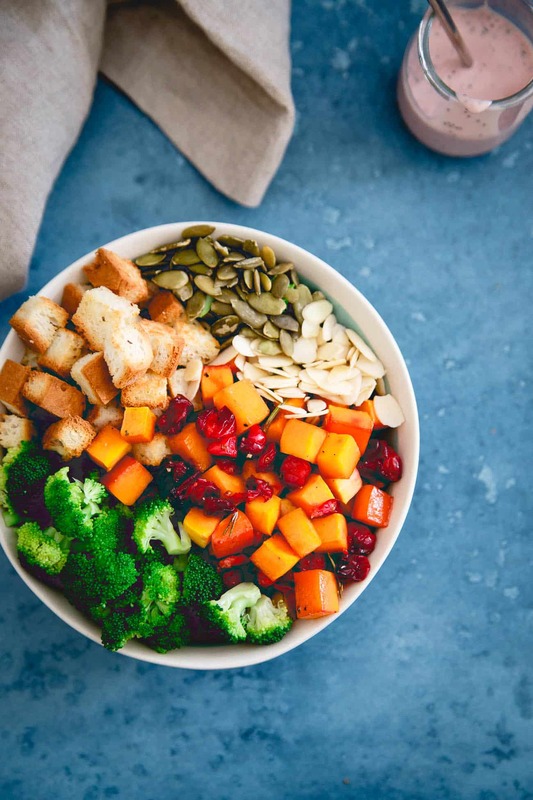 Butternut squash – packed with beta-carotene which our body’s convert to Vitamin A, it’s a natural anti-inflammatory for our immune systems and promotes blood and circulatory health. It’s also high in omega-3s and much lower in calories than traditional sources (like nuts). 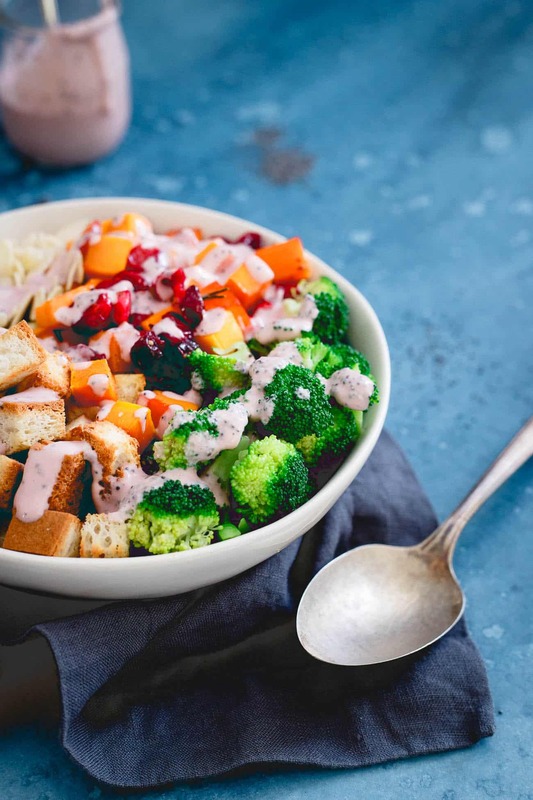 With all those health benefits in this tasty bowl, it’s a total win, win situation. Psst– don’t overcook the broccoli. Life’s too short for mushy broccoli salads. Toss the cubed bread and melted butter together and spread out in an even layer on a baking sheet. Place in the oven until browned and crispy, about 10 minutes. Remove and set aside. 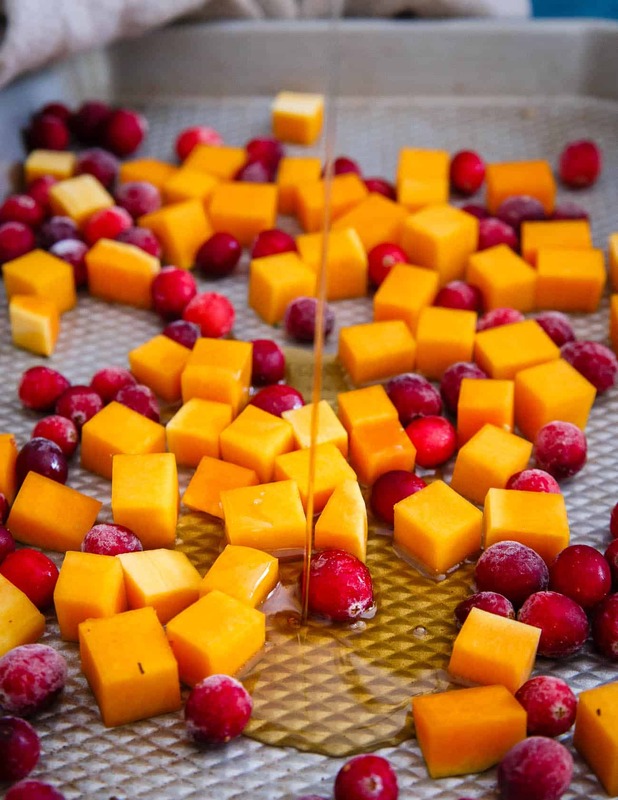 Toss the butternut squash, cranberries and maple syrup together. Spread out on the same baking sheet used for the bread. Season with rosemary, salt and pepper and roast for 15 minutes until cranberries start to burst and maple syrup caramelizes. Meanwhile, bring a large pot of water to a boil. Place the broccoli florets into the boiling water for 45 seconds. Remove, transfer to an ice bath to cool then drain. Whisk all the ingredients for the dressing together in a small bowl until combined. 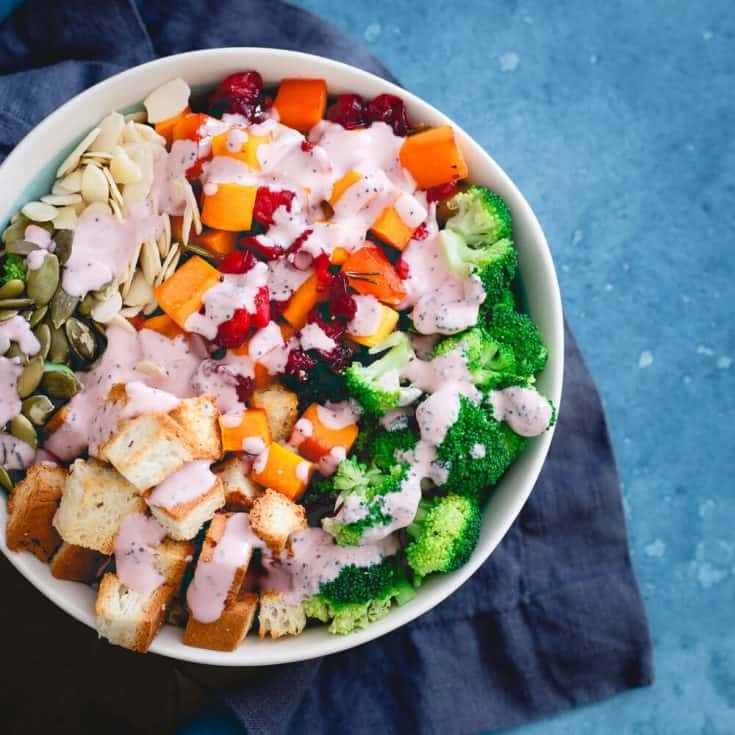 Combine the broccoli, roasted butternut squash and cranberries, pepitas, almonds and toasted bread in a large bowl. Pour the dressing on top and toss until well combined. 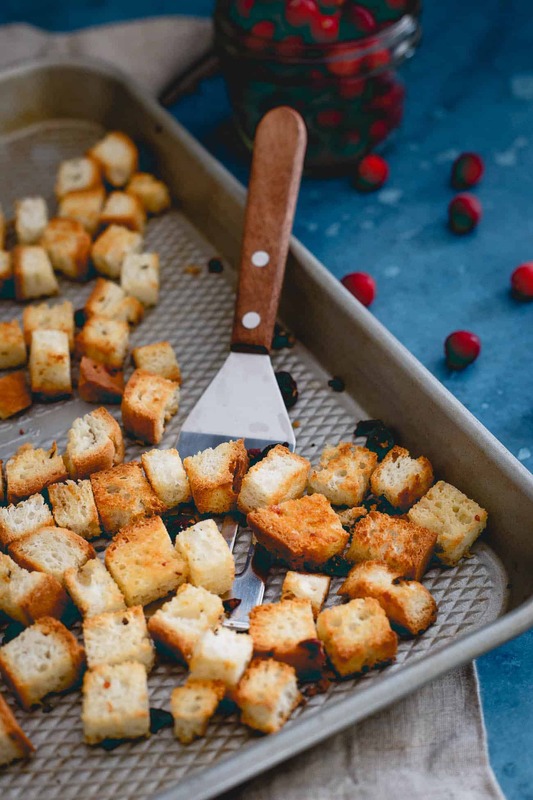 Don't toss the salad with the dressing until right before serving so the croutons stay crispy. How beautiful is this salad? So colorful and full of delicious autumn flavors! I would love to make this for Thanksgiving, because you know, most side dishes are full of butta! What a beautiful salad! Loving the colors and flavors happening here. Broccoli salad is one of my favorite things EVER!! Totally loving that you added Udi’s!! Love this salad – and that dressing is such a gorgeous color!! Such a gorgeous salad! It looks like it has so much flavor. And I love that you used maple syrup!